Bryan-Morris Ranch manager Jim Morris stands in a flooded alfalfa field along the Scott River in Siskiyou County. California's aquifers are shrinking as more growers pump groundwater to keep crops alive. But that fertile farmland may also provide the means for replenishing groundwater to benefit everyone in the drought-stricken state. Researchers at the University of California, Davis, are encouraged by early results from tests to see if deliberately flooding farmland in winter can replenish aquifers without harming crops or affecting drinking water. "On-farm flooding looks very promising," said professor Helen Dahlke, a hydrology expert with the UC Davis Department of Land, Air and Water Resources. "We're pleasantly surprised by how quickly water tables have responded to on-farm flooding without damage to crops." 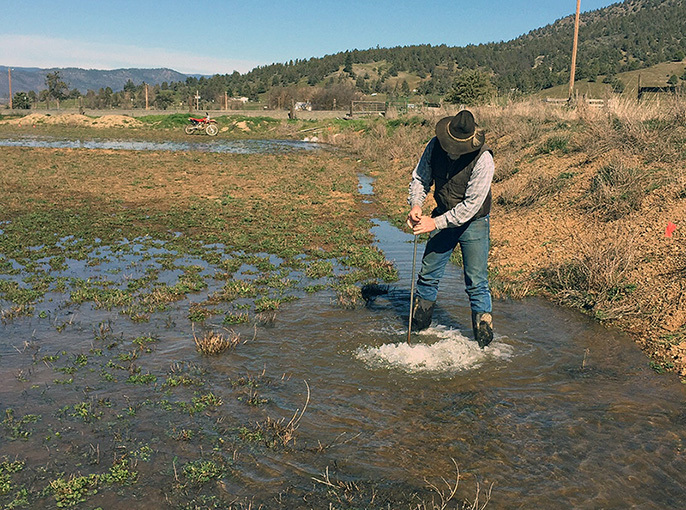 In spring 2015, Dahlke's team flooded alfalfa at Bryan-Morris Ranch in Siskiyou County, applying more than twice the irrigation the field normally gets in a year. The field produced more weeds than usual, but otherwise, the alfalfa suffered no ill effects. "It was amazing to see how well the land absorbed the water and how quickly the water table rose," said Jim Morris, Bryan-Morris Ranch manager. "That's good news for farming and the environment." to aquifers. In that research, scientists flooded pistachios, alfalfa hay and wine grapes. "Our wine grapes were under water for five months, which raised a few eyebrows, but they did fine," said Don Cameron, manager of Terranova Ranch along the Kings River in Fresno County. "Diverting floodwater to farms can recharge groundwater and reduce the risk of downstream flooding. It's a good situation all around." infiltration basins ─ confined areas of sandy soil. But land dedicated to infiltration is scarce. Can California's farmland be called into service? There's a lot to consider, Dahlke said. Not all soils are particularly permeable, and not all crops can tolerate extra irrigation in the winter. Some soils are especially salty, and some crops need more nitrogen than others. Researchers wonder whether flooding fertilized farmland or saline soil will leach those chemicals into the groundwater. Or, could on-farm flooding actually improve groundwater quality by diluting salts and nitrates? crop damage or groundwater contamination. Pears, wine grapes, many annual crops, and some varieties of almonds, peaches, and plums appear best suited for on-farm flooding, the team found. "Alfalfa might also be an ideal crop for groundwater banking because it requires little or no nitrogen fertilizer," O'Geen said.